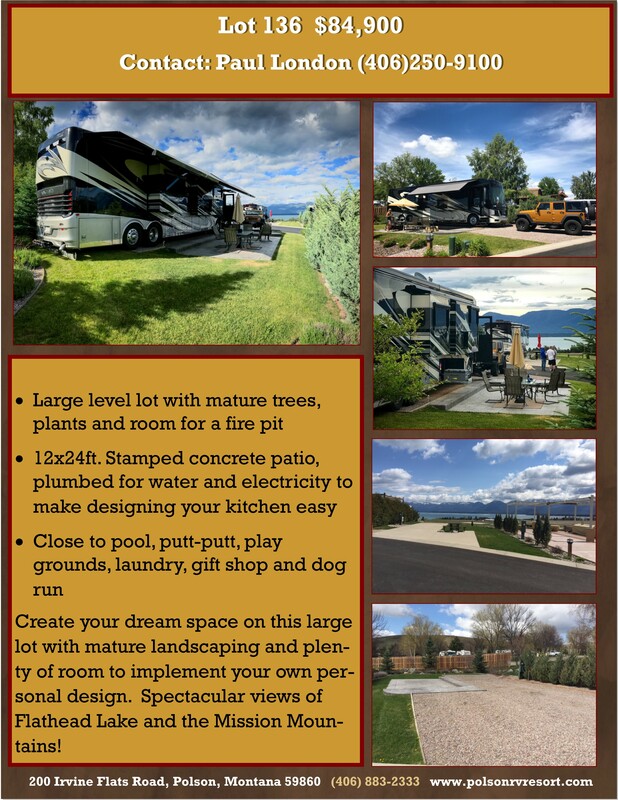 Create your dream space on this large lot with mature landscaping and plenty of room to implement your own personal design. 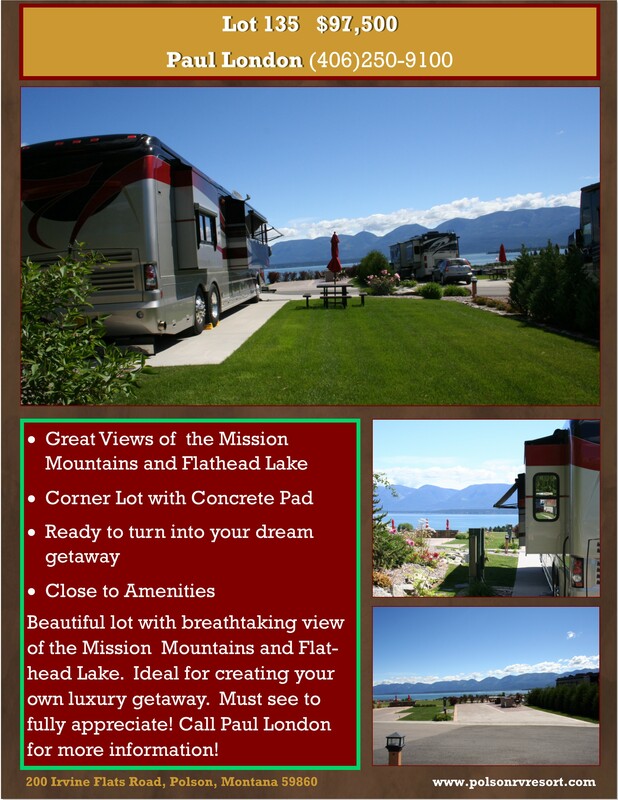 Spectacular views of Flathead Lake and the Mission Mountains! 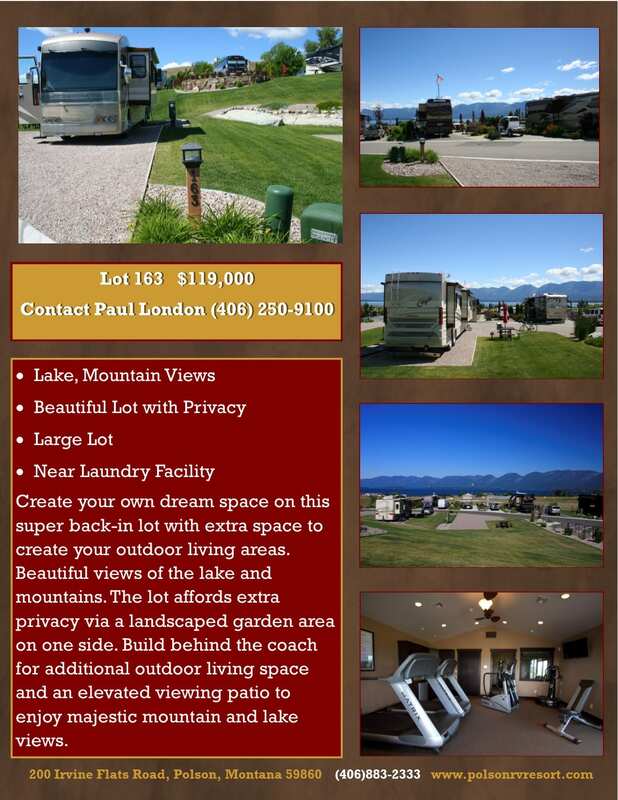 Beautiful lot with breathtaking Mission Mountain views and partial Flathead Lake views. Ideal for creating your own unique resort oasis. Must see to fully appreciate! 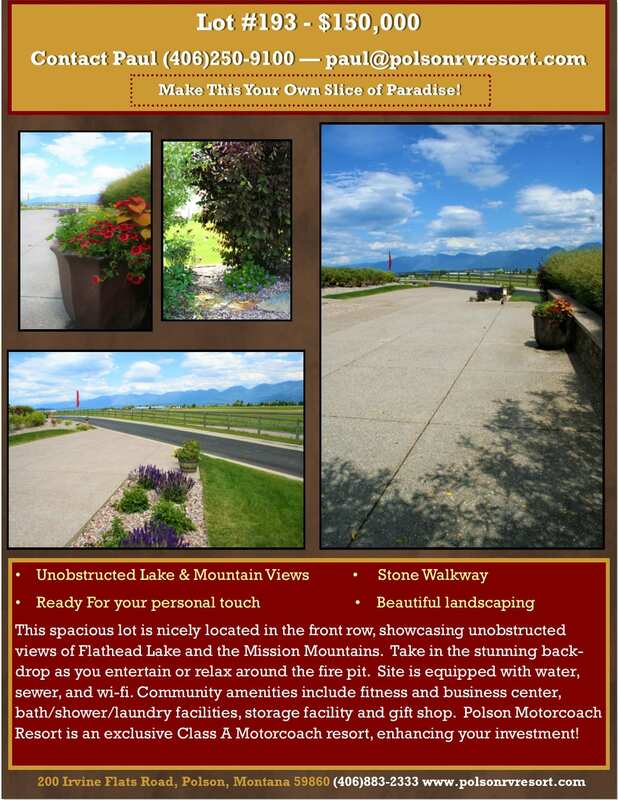 Fabulous top-row lot with outdoor kitchen, mature landscaping, and lake and mountain views awaits! Create your dream space on this super back-in lot. Enjoy watching the Mission Mountains’ ever-changing colors and magnificent sunsets. 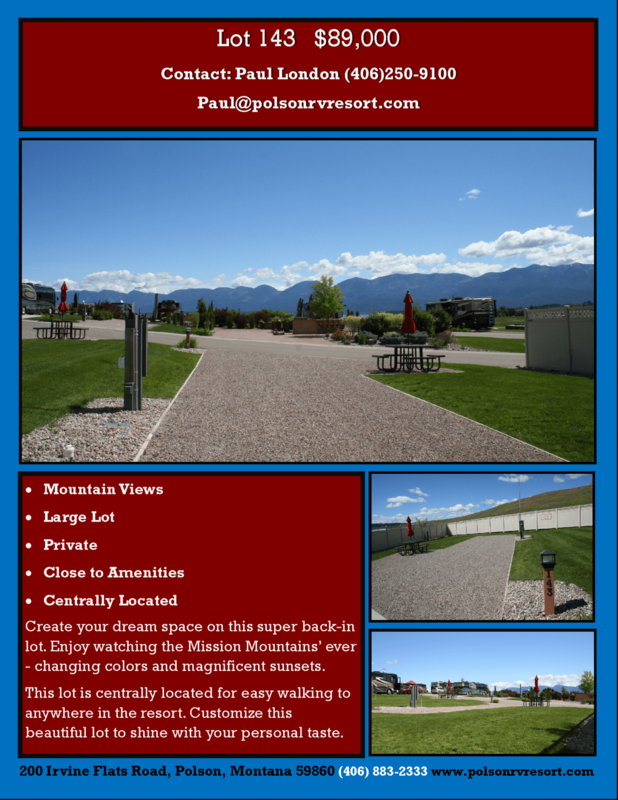 This lot is centrally located for easy walking to anywhere in the resort. Customize this beautiful, peaceful lot to shine with your own personal taste! Create your dream space on this super back-in lot. 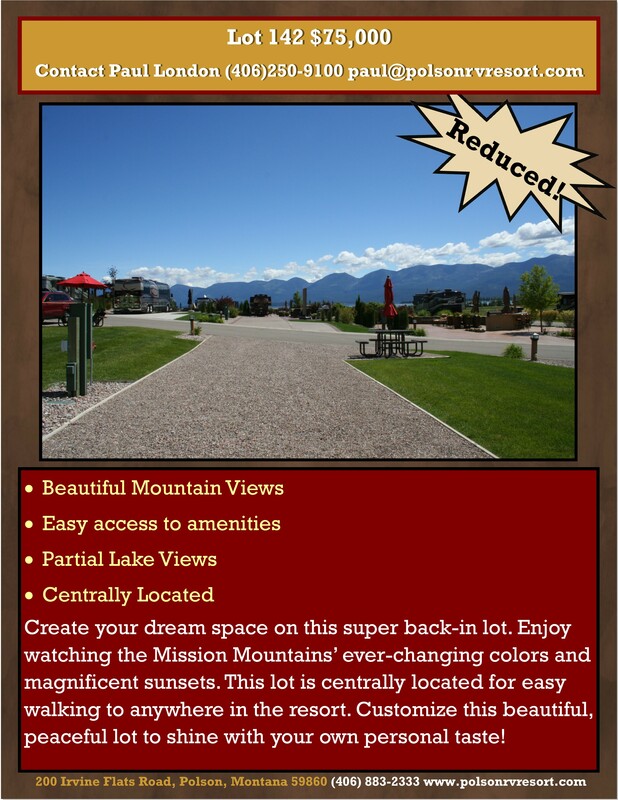 Enjoy watching the Mission Mountains’ ever - changing colors and magnificent sunsets. This lot is centrally located for easy walking to anywhere in the resort. Customize this beautiful lot to shine with your personal taste. Create your own dream space on this super back-in lot with extra space to create your outdoor living areas. Beautiful views of the lake and mountains. 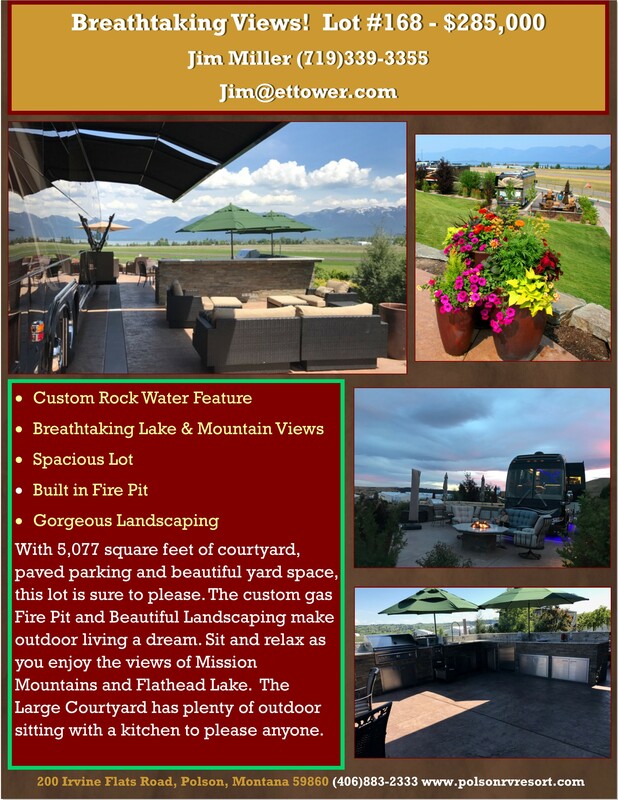 The lot affords extra privacy via a rock and grass bank for landscaping set behind the coach that can also be built up to provide an elevated viewing patio to enjoy unobstructed lake views. Create your own dream space on this super back-in lot with extra space to create your outdoor living areas. Beautiful views of the lake and mountains. The lot affords extra privacy via a landscaped garden area on one side. 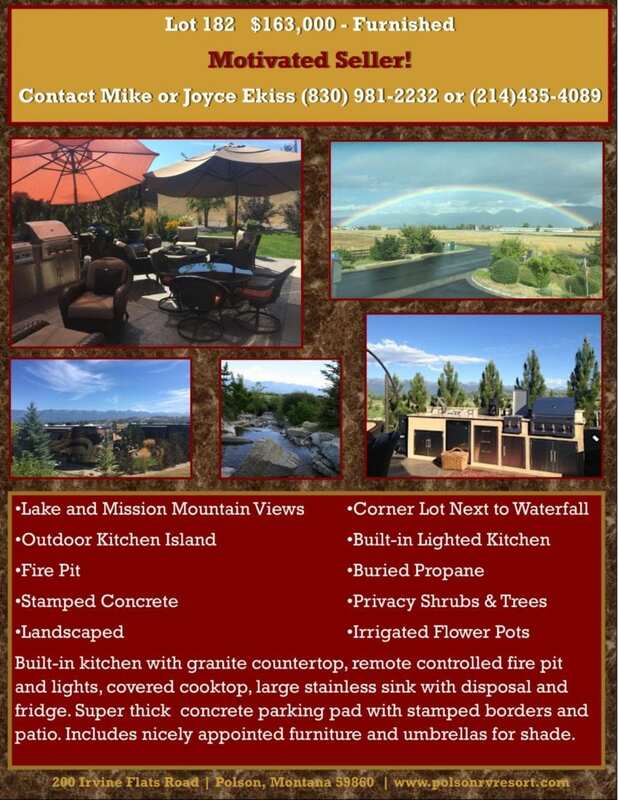 Build behind the coach for additional outdoor living space and an elevated viewing patio to enjoy majestic mountain and lake views. Design your dream space on this large, quiet lot to suit your lifestyle! This lot has a lot of potential. Create your dream space on this very nice pull-in lot with extra space to create a spacious outdoor living area. 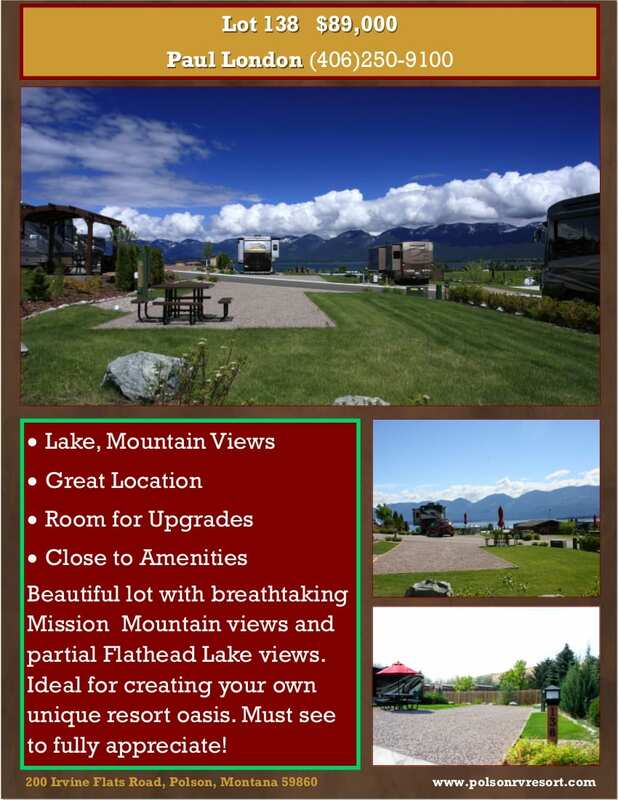 Views of Flathead Lake and the Mission Mountains are seen from the coach front and patio area. 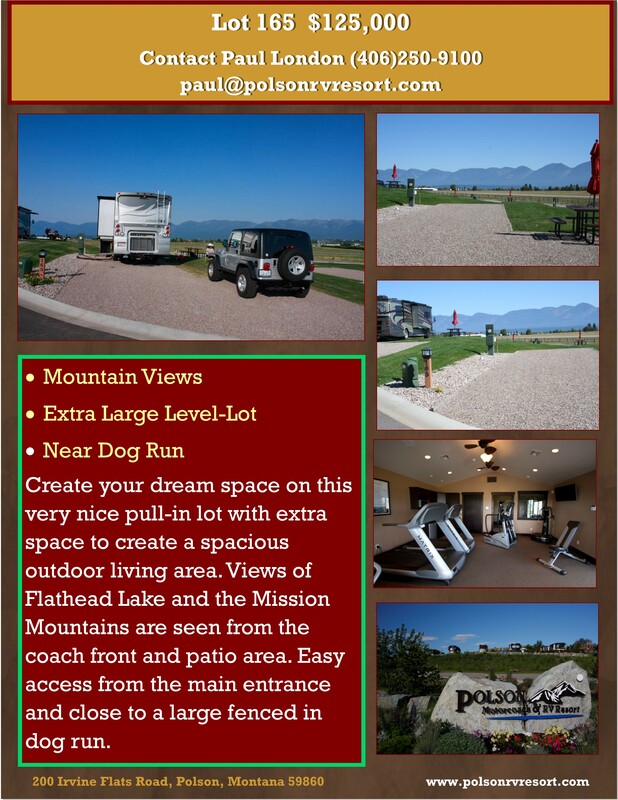 Easy access from the main entrance and close to a large fenced in dog run. 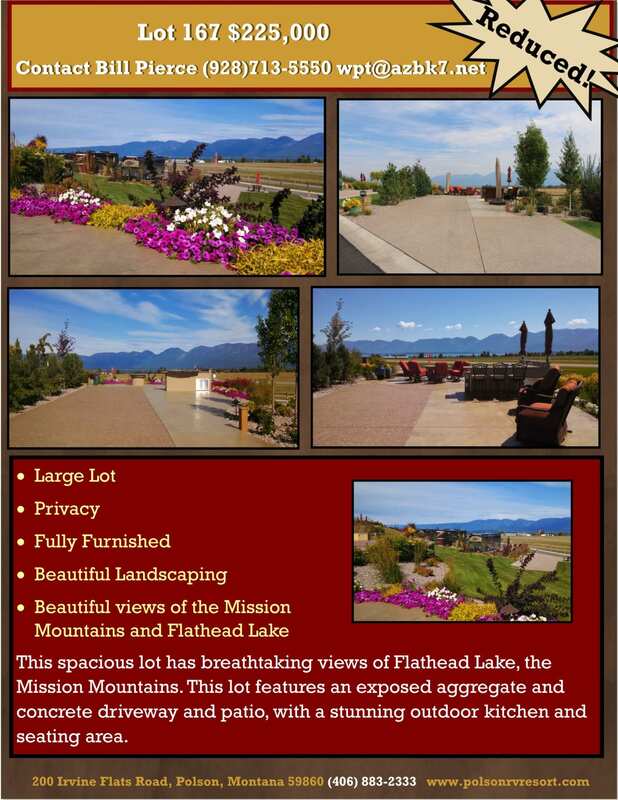 This spacious lot has breathtaking views of Flathead Lake, the Mission Mountains. This lot features an exposed aggregate and concrete driveway and patio, with a stunning outdoor kitchen and seating area. With 5,077 square feet of courtyard, paved parking and beautiful yard space, this lot is sure to please. The custom gas Fire Pit and Beautiful Landscaping make outdoor living a dream. 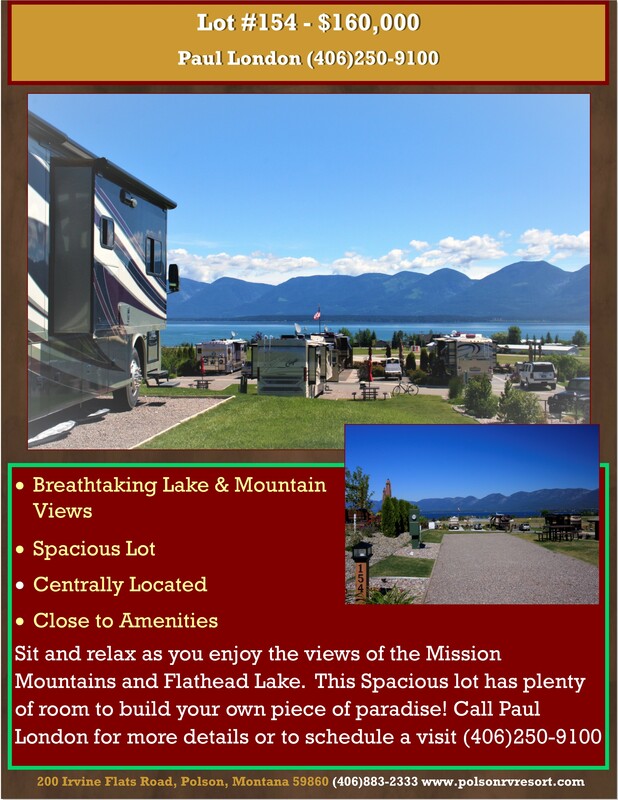 Sit and relax as you enjoy the views of Mission Mountains and Flathead Lake. The Large Courtyard has plenty of outdoor sitting with a kitchen to please anyone. This large fully-furnished lot has extra parking area ad is complete with both upper and lower plumbing ready for your very own kitchen and bar designs. 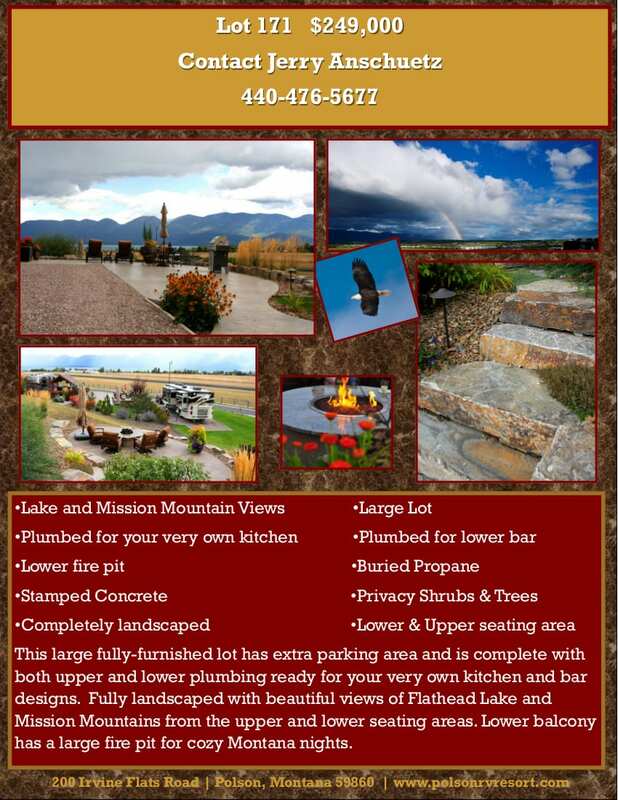 This prime lot has stamped concrete,beautiful shrubs and flowers and magnificent Mountain and Lake views. The peaceful stream running along the front and quaint waterfall feature creates a tranquil oasis. The full-kitchen offers bar seating with great lake views, a large sink with disposal, stovetop cooking, refrigerator and freezer compartments. 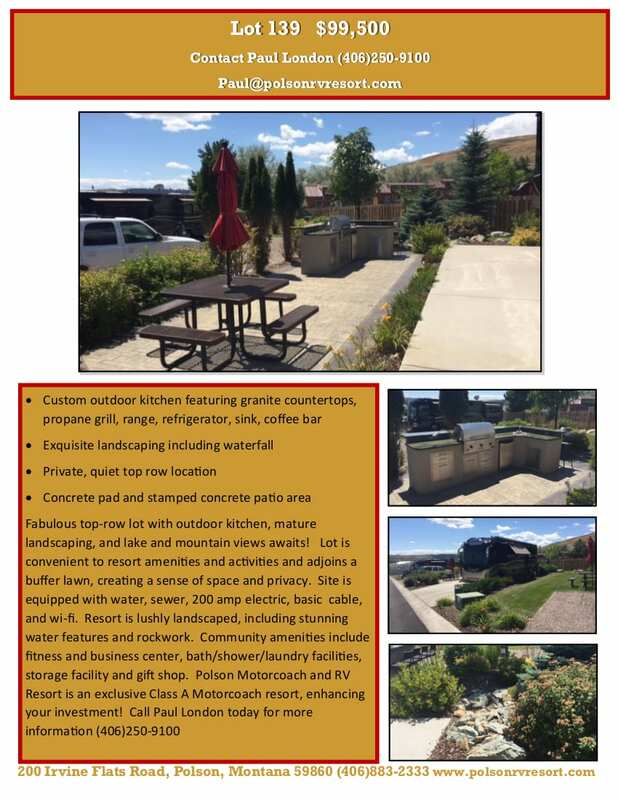 Built-in kitchen with granite countertop, remote controlled fire pit and lights, covered cooktop, large stainless sink with disposal and fridge. Super thick concrete parking pad with stamped borders and patio. Includes nicely appointed furniture and umbrellas for shade. 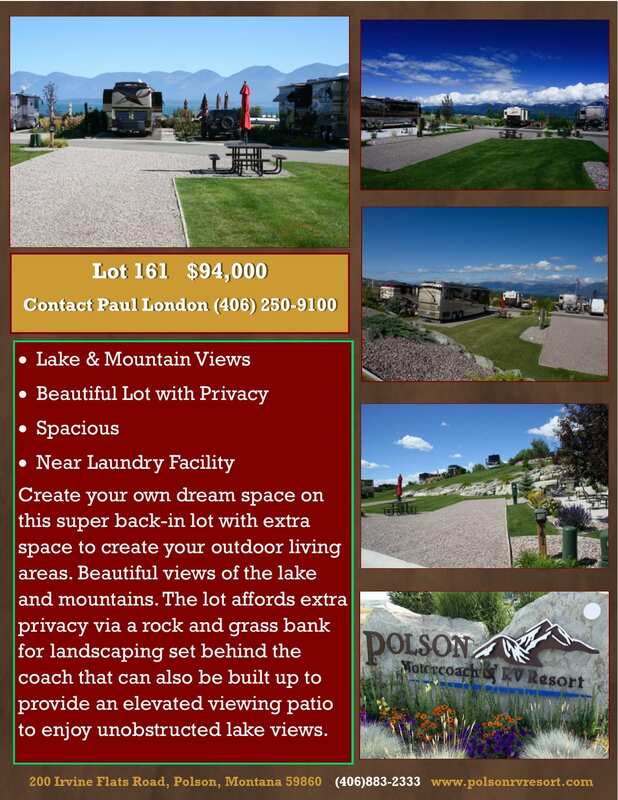 This great lot has super views of Flathead Lake, the Mission Mountains and breathtaking alpenglow sunsets. This lot allows for plenty of outdoor living space, so design your dream coach site! 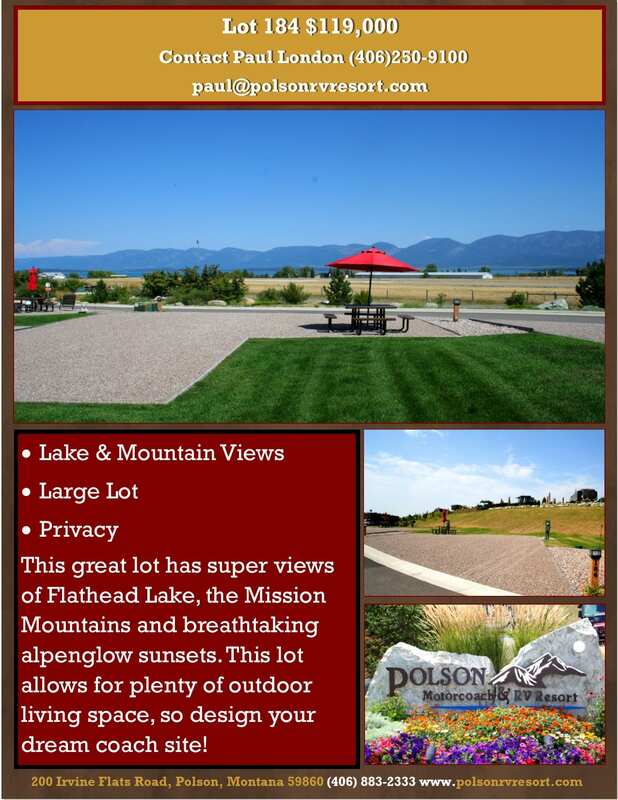 This spacious lot is nicely located in the front row, showcasing unobstructed views of Flathead Lake and the Mission Mountains. 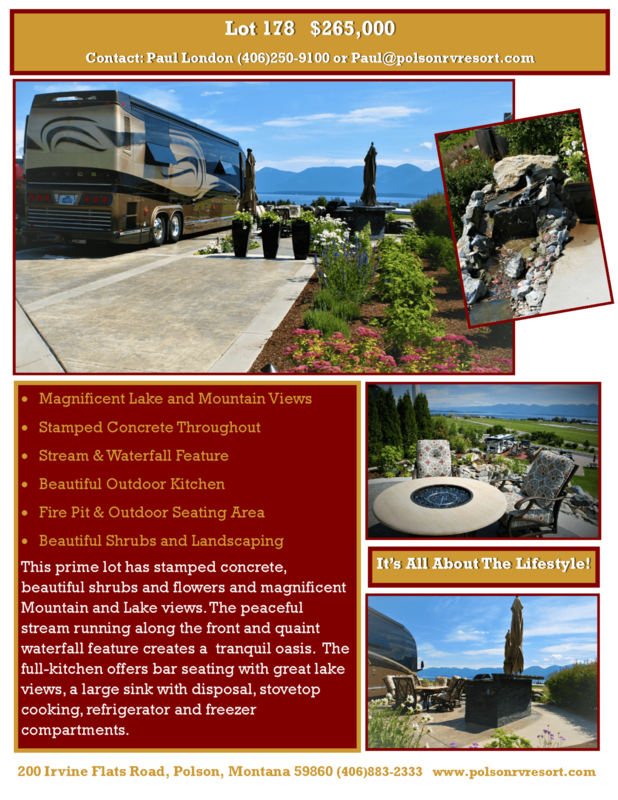 Take in the stunning backdrop as you entertain or relax around the fire pit. Site is equipped with water, sewer, and wi-fi. Community amenities include fitness and business center, bath/shower/laundry facilities, storage facility and gift shop. 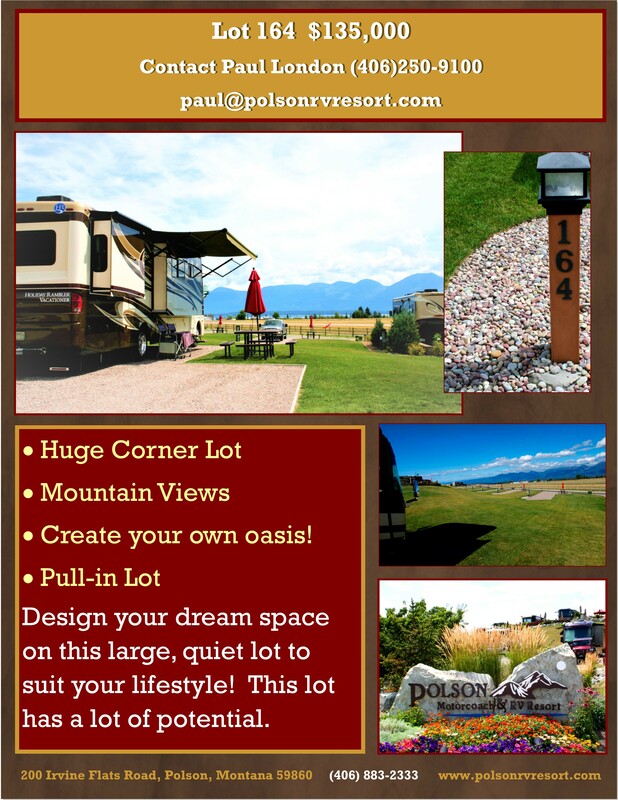 Polson Motorcoach Resort is an exclusive Class A Motorcoach resort, enhancing your investment! 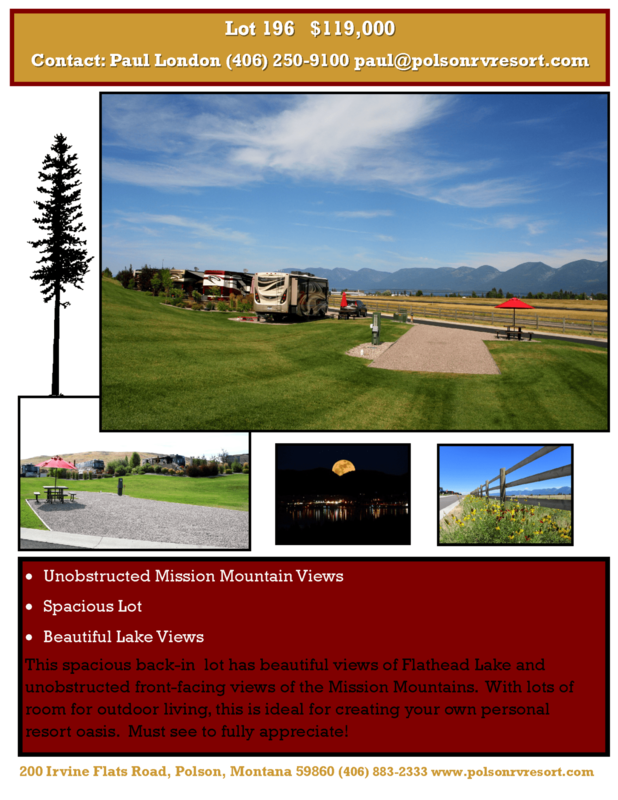 This spacious back-in lot has beautiful views of Flathead Lake and unobstructed front-facing views of the Mission Mountains. With lots of room for outdoor living, this is ideal for creating your own personal resort oasis. Must see to fully appreciate!